Updated 11-15-2018 --- Mod has been updated to work with the 1.47.49 (November 13, 2018) game patch. Adds the clubs.gather and clubs.disperse commands. Clubs currently gathering are indicated by (G) on clubs.list. Checks that the game's club service exists, in case no game pack is installed which includes club support. 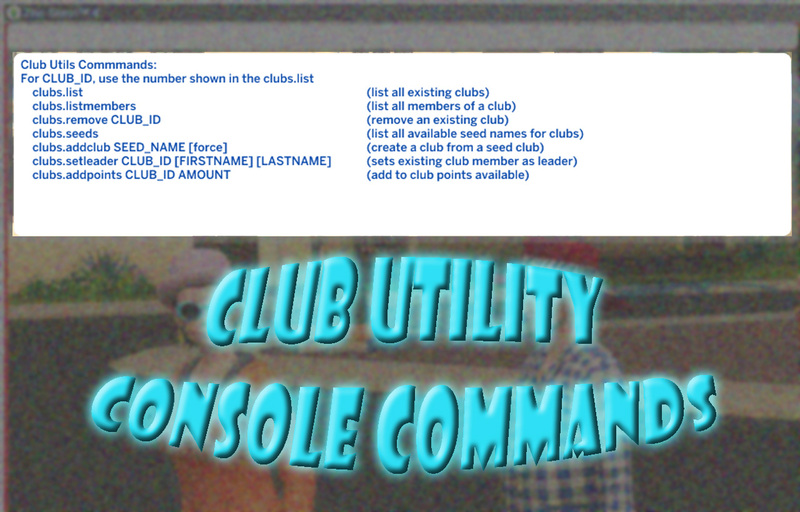 This adds a few basic utility commands for the cheat console to modify clubs in The Sims 4 allowing you to remove the game's built-in clubs, add "seed" clubs back into your game, or set the leader of a club so that you can modify it further. Usage is fairly simple, and the clubs.help command will list the available commands and options. clubs.list - Lists all clubs that are in your game. Use this to see what CLUB_ID number to use for one of the other commands. Since the built-in clubs use a translated string that the script has no access to, the internal "seed name" for that club will be shown in the list. clubs.listmembers CLUB_ID - Lists all the Sims in a club and identifies who the current leader of that club is. The CLUB_ID should be the number as shown in the clubs.list output. You should use the clubs.list command prior to any use of a command which requires a CLUB_ID. That club id can change any time a club is modified as the order of the clubs stored internally may shift around. clubs.remove CLUB_ID - Removes the club with the indicated club id. clubs.seeds - Lists the available club seed names which can be used to add one of the game's built-in clubs back into your game. clubs.addclub SEED_NAME - Add a seed club into your game. The club will be populated with a minimal number of existing Sims. If there are not enough available Sims which meet the club requirements this command may fail. It is normally not allowed to add a seed club twice; however, if you have modified an existing club it may be desireable to override this behavior. You can add the force parameter to the end of this command to allow a duplicate of an existing seed club (two DJs clubs, for instance). clubs.setleader CLUB_ID - Sets the current Sim to be the leader of the chosen club. You may add the first and last name of a Sim to the command to promote that Sim instead of your current Sim. Note that the Sim must already be a member of the club in order to be set as the leader! clubs.addpoints CLUB_ID AMOUNT - Add the requested amount of Club Points to the club with the specified club id. clubs.gather CLUB_ID - Request a club gathering on the current lot for the club with the specified club id. clubs.disperse CLUB_ID - Ends a club gathering for the club with specified club id. Now we can use the game's dialogs to rename the club from Powerhouse to what we want, The Sweaty Ones. Since this is a custom name, it will now display as such in the clubs.list output. Next we want to remove the Knights and replace the Avants with Punch Lines. This is a script mod, so to install you should extract the MTS_Scumbumbo_ClubUtils.ts4script file from the zip you downloaded into your Mods folder. It may be placed into a subfolder if desired, but it must not be more than one subfolder away from your Mods folder. 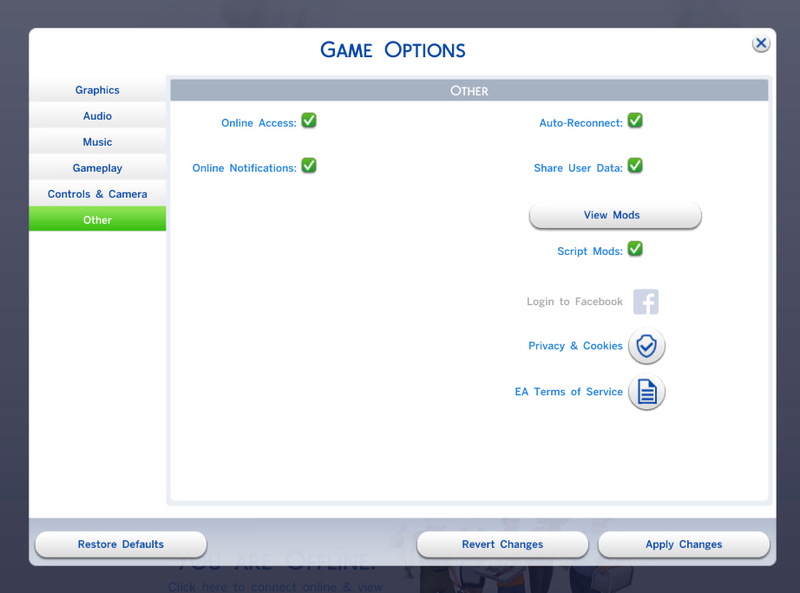 Don't forget that script mods must be enabled in your game options! The mod was written for the most recent version of The Sims 4 at this time, patch level 1.47.49 (November 13, 2018). Compatibility with newer versions of the game may vary. Thanks to nabob052 for command ideas. Thanks to magneticsouth for ideas and testing which revealed a bevy of bugs to banish.